We are committed to transparency in our client work and in our workplace. 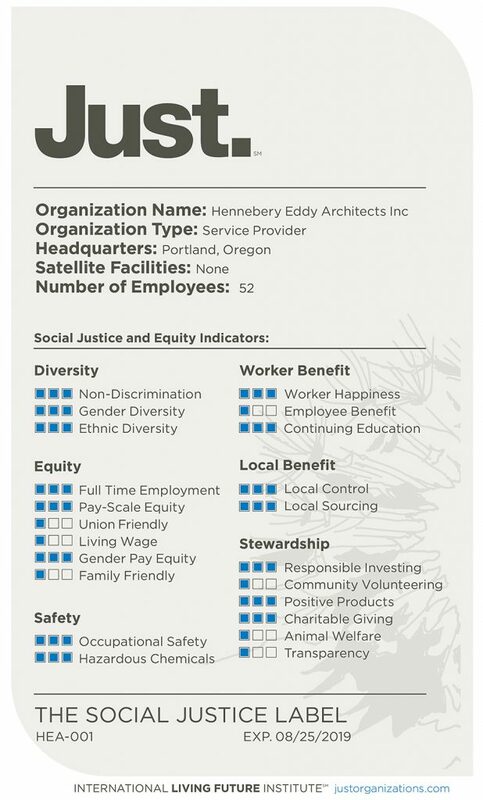 Hennebery Eddy is committed to transparency in our client work and in our workplace, and we are driven to become a leader in workplace equity. The firm’s policies are in line with the International Living Future Institute’s program for “Just” organizations, a set of 22 social and equity indicators that fall into six categories. Our voluntary disclosure of a range of organizational and employee-related metrics is our public pledge to evaluate areas for continual improvement with regard to our business practices and personnel policies. In October 2017, we received our first Just label — which is like a nutrition label for equitable organizations. As part of the process of earning that label, the firm formalized existing policies and implemented new programs that promote Just values. Using the six Just categories, we continually examine and improve our practices that contribute to greater social justice and equitable treatment of all — from how we treat employees to where we make financial and community investments. As a Just organization, we also advocate payment of a living wage to our suppliers, vendors, consultants, and other partners. More information on the Just program is available at justorganizations.com. As an ILFI Just organization, our label lets you see “what’s inside” the business of Hennebery Eddy. Click to learn more about our internal policies and programs.